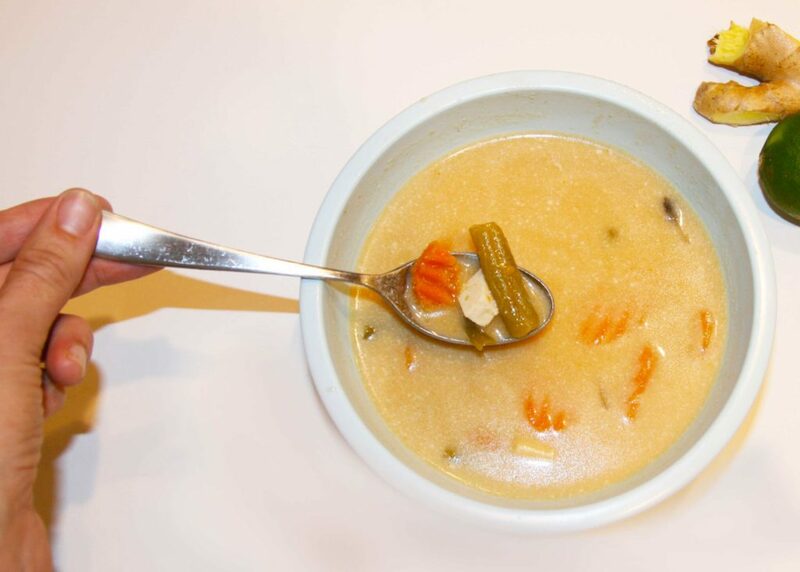 Inside: Look no further for the best Thai curry soup recipe including a creamy blend of coconut milk, curry, and vegetables. This Thai curry soup recipe is a creamy blend of coconut milk, curry, and vegetables, is the perfect solution for warming up from chilly weather. I like to make a double batch of this savory vegetarian soup or freeze half to save for a lazy day. This flavorful Thai Coconut Curry Soup Recipe is a tasty way to add some variety our weekly lunch or dinner menu. To begin, cut and steam the carrots, mushrooms, sweet potatoes and green beans. 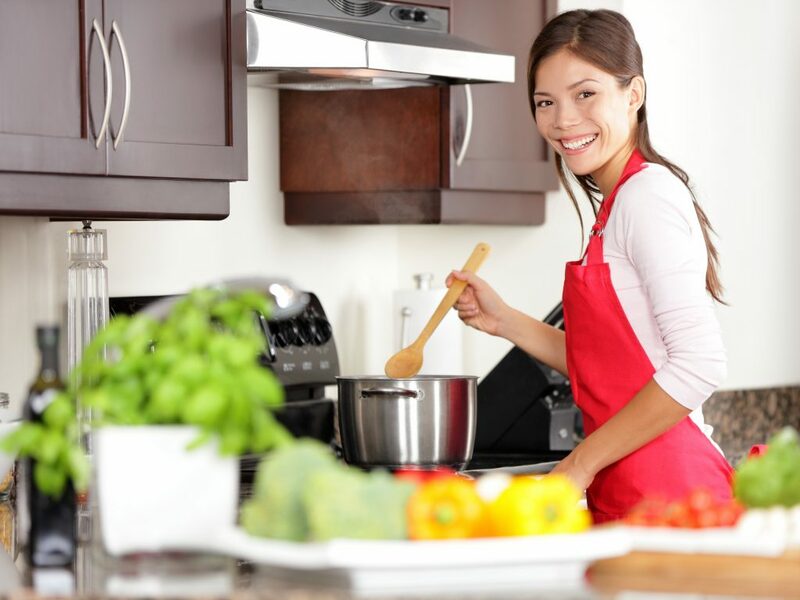 If you are short on time, you can use frozen or canned vegetables instead of fresh. Next, to make the base broth for the soup, combine the vegetable broth, garlic, and ginger to a pot. Simmer for 20 minutes. While the base broth is simmering, combine coconut milk, sugar, lime juice, soy sauce, curry paste, and tofu into a bowl. When the broth is done simmering. Strain the broth into a large pot, collecting the minced garlic and ginger into the strainer. Add the bowl of coconut milk, sugar, lime juice, curry paste, and tofu into the large pot, with the broth. Mince one tablespoon of the boiled ginger into the large pot. Stir in the vegetables. 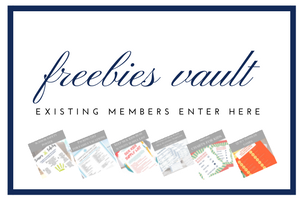 As a busy mom, I am always looking for tips and tools to make my life easier. If you have never tried a stackable steamer, you don’t know what you are missing out on. It’s awesome for a recipe like this Thai Coconut Curry Soup because you can steam several items at once. I set the timer for the item that will be done first, and then forget about it. Once the timer goes off, I remove that stack and let the rest finish. It makes preparing dinner that much easier. Serve the soup and devour! 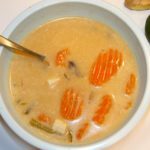 Look no further for the best Thai curry soup recipe including a creamy blend of coconut milk, curry, and vegetables. Steam sweet potatoes, carrots, green beans, and mushrooms. Combine vegetable broth, garlic, and ginger and simmer for 20 minutes. Combine coconut milk, sugar, lime juice, soy sauce, curry paste, and tofu into a bowl. When the broth is done simmering. Strain the broth into a large pot, collecting the minced garlic and ginger into the strainer. Add the bowl of coconut milk, sugar, lime juice, curry paste, and tofu into the large pot, with the broth. Mince one tablespoon of the boiled ginger into the large pot. Delicious soup! 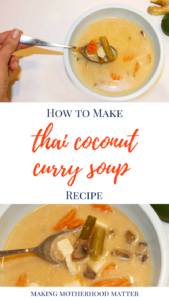 I love anything with coconut and I have yet to try Thai coconut soup but have always heard about how good it is. Your recipe looks simple to make, I have to give it a try!